Michael Brelo case: Judge John P. O’Donnell explains why he let the Cleveland police officer off. 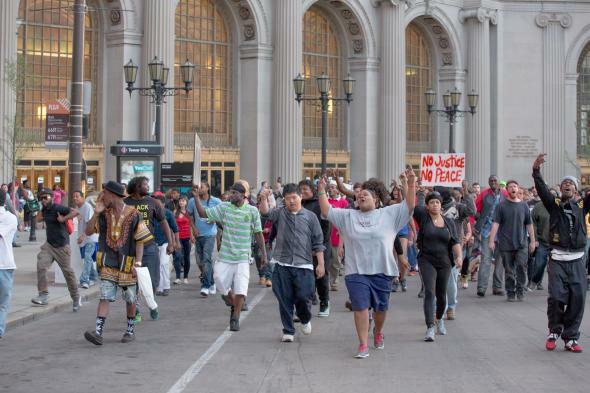 Protesters take to the street in May 2015 after Michael Brelo was acquitted of manslaughter. Politico Magazine just published a thorough and illuminating interview with the Cleveland judge who ruled on May 23 that Officer Michael Brelo was not guilty of committing any crime when he fired 49 shots into a car on the night of Nov. 29, 2012, in an incident that resulted in the death of a black homeless man and woman, both unarmed. Brelo was one of 13 officers who fired their weapons during the shootout, which took place after an extended car chase through Cleveland and resulted in a total of 137 bullets being fired at Timothy Russell, 43, and his passenger, 30-year-old Malissa Williams. In the Politico interview, Cuyahoga County Judge John P. O’Donnell—who presided over Brelo’s bench trial—explains to writer Daniel J. McGraw why he decided Brelo could not be legally convicted of involuntary manslaughter, which prosecutors had charged him with based on the fact that, during the shootout, he jumped up on the hood of the car in which Russell and Williams were sitting and fired 15 shots into the windshield. If you had 13 officers all shooting, and you could not prove which one did the fatal shooting, but were certain they all acted criminally with the purpose to kill the person, then one could possibly find them guilty if you could show they were aiding and abetting [each other]. I don’t want to say the result would have been different, but I do want to say that the lay of the land would have been very different if all 13 of the police officers had been charged with the same crime. And I can envision a scenario where failure to prove a particular bullet from a particular shooter caused a particular injury would not have prevented a guilty verdict because of the complicity of the actions. For the many people across the country who were horrified and angered by O’Donnell’s verdict, this answer is a reminder that, insofar as the untimely deaths of Russell and Williams were met with a miscarriage of justice, it was an outcome that began with the prosecutor’s office. That same prosecutor’s office is currently investigating the death of 12-year-old Tamir Rice, who was killed by a Cleveland police officer last November, and is expected to bring evidence before a grand jury.